"Breath is the bridge which connects life to consciousness, which unites your body to your thoughts. Whenever your mind becomes scattered, use your breath as the means to take hold of your mind again." I don't think I did a very good job of staying in the moment today. Don't get me wrong I had a lovely day but as I type this out and look back on it, I think I was very busy and didn't breathe and take it all in enough. I was running from one thing to another and constantly distracted. I first did some cooking in the morning and watched the new episode of Bunheads. I know its not "great" tv but I have always wished I would have found a passion for dance when I was younger. I took both the little boys to the dentist and sat and read a couple of articles in Yoga Journal which was quite nice. I haven't made time lately to enjoy magazines. I have always been fond of magazines. The superhero and I have always hung out at the library together and there is such a soothing and lovely feel to reading magazines lounging at the library. When my oldest was a baby it was so fun to take him to the library and let him crawl around while we read magazines and let him explore in a safe environment. My love of Doctor Who began from checking out episodes from the library. I don't know if I wasn't staying in the moment or if the day just seemed to pass too quickly although they are probably one in the same. On our way home from the dentist we stopped at the Des Moines Feed Store. I was looking for female Button Quail. We have one very lonely male and it just breaks my heart that he is all alone. No luck finding females but we ran into my beekeeper friend Jerry. We stood around chatting with the feed store guys while Milo and Medes played with the big fat friendly gray cat that lives in the store. The feed store guys have all kinds of birds of their own and like to gossip about other bird owners and talk shop. A couple of old fellas would drop buy and chat and one gentleman with a very cool walking staff brought in a buck skull and rack to show off. The buck had died from getting caught on their grape vines. He had strange antlers that grew together in the front. I recommend hanging around the feed store to anyone. They know all about yard birds and gardening. I just love running into my friend Jerry. He is 69 and has children my age. He is fit and sharp minded and has lots of interests and no problem giving me a hard time like he would his own kids. He mentioned today, with a fondness in his voice, that I remind him of one of his daughters. I like to come around and check out his bee hives and talk with him and I don't have a problem getting dirty or opening up a bee hive to check them out. He loves to spoil the boys with chicken, duck, and goose eggs. He raises pigeons and has cages of them all over his yard and he lets them out to fly daily. He gave my oldest son Sam the first pair of Muscovy ducks last spring. The female died and the male has been a lonely uptight guy ever since. When I saw Jerry today I asked him if he had any female ducks and he invited us over to his house to get one. Meet Gloria the Muscovy Duck girlfriend! Jerry's wife has been in Florida visiting a couple of their kids and their families and Jerry has been all alone since then. He has lots of friends and goes out to eat every day but he really seemed to enjoy having us around today. I always like talking bees and gardening with him. 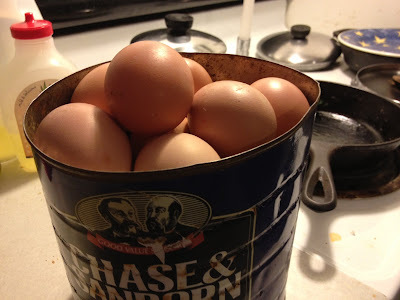 He gave Archimedes a huge coffee can of fresh eggs and he let the pigeons out and fed them for the boys. He told Archimedes that it was his job to bring back the coffee can. Medes was very excited at the prospect of visiting Jerry again. Archimedes is quite interested in building bee hives. He wants to make plans and designs to build the bees homes. He is the maker where as Milo just wants the honey! He also wants to help put it into jars and sell the honey. I love how they compliment each other. When we got home the Superhero took the little fellas to a craft and story at the Franklin avenue library and I stayed home with the older boys. 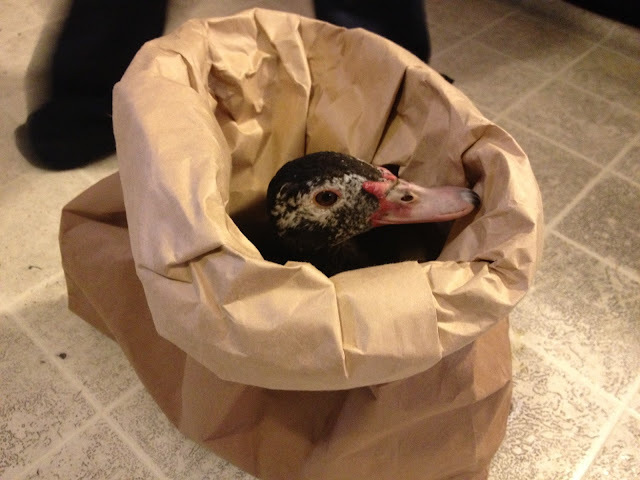 Jupiter had his Supported Community Living therapist over and Sam and I took care of the new duck. I also got in a 12 minute meditation with the lights down and a fairly quiet house. Days like this are fun and I am thankful that I had energy to enjoy it. I am going to work harder to take some time on my busy days and breathe and just take it all in quietly. As for Yoga.... I skipped it during the day. I needed a break and I just wasn't feeling it. While laying here in bed I did my night time routine so I did do some yoga but its perfectly fine to take days off from upright asana practice. The bed time routine was incredibly relaxing and because I was doing it to relive some lower back pain I was working hard to focus on my breath and really let go of stress.